Are you one of those people who can’t find a balance between work, family and exercise? Do you wish that you could surf the internet, video chat with your loved ones or simply write a document on your laptop while working out on an upright bike? If yes, then FitDesk 2.0 Desk Exercise Bike with Massage Bar is a wish come true for you. 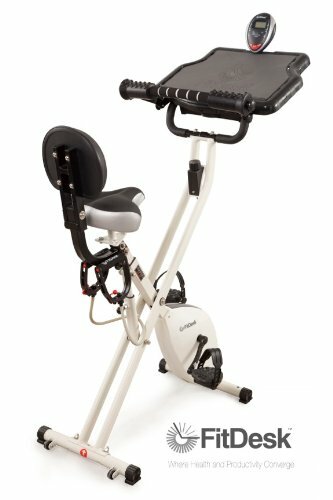 It wouldn’t be wrong to say that this bike is a milestone in innovation and practicality in the world of exercise bikes. 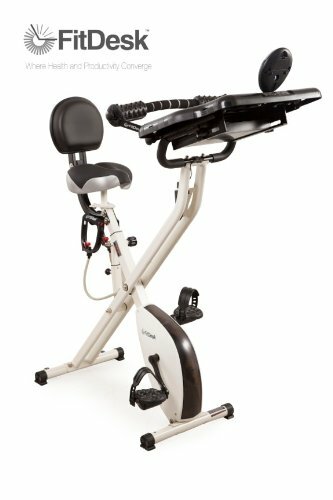 When you talk about an upright exercise bike you must imagine an exercise bike that requires all your focus and energy, which requires you to sit in an upright position and hold the handle-bars in order to get a steady workout but the FitDesk 2.0 defies all rules as to how to work-out on an upright exercise. The most alluring feature of this bike is the 16”x19” non-slip desk surface that will fit any laptop so you stay connected to the world while getting your desired workout. The bike comes equipped with tons of other amazing features as well that we are going to review in this article. The FitDesk 2.0 when fully assembled, stands 54 inches tall and has a compact footprint of 16 inches x 26 inches (width x length) which means that it can be placed anywhere with 3 x 3 feet clearance. In addition to the compact size the bike is extremely lightweight, weighing around only 45 lbs. after being fully assembled it is one of the lightest exercise bikes in the market. The light weight and compact size paired with the built-in wheels makes it the easiest bike to transport from one place to another. And if that’s not enough practicality for you, get this, the entire bike is foldable and can be stored literally anywhere so when you’re done working out you can just get the bike out of the way in less than a minute of hassle. Let’s start first with the mechanism of the bike. The FitDesk 2.0 uses magnetic resistance to provide you a ultra-smooth and noise-free workout which means that you can work and exercise at 2 in the night without waking up your housemates in the next room. There are 8 different resistance levels which can be toggled with the help of a simple knob located on the front vertical bar in front of the user. 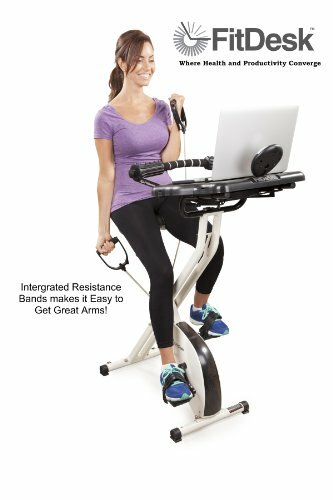 In case you want to take a break from all the typing and you feel like your upper body could use some exercise, the bike comes equipped with upper body resistance bands so your upper body doesn’t feel left out and you get a proper full body cardio workout. Moving on to the seat of the bike, unlike most upright bikes it comes with a backrest and extender making this a kind of semi-recumbent bike. The seat is modelled for sheer comfort and can be adjusted for a more back lean ride or a more forward lean ride. Moreover it is heavily padded so you don’t need a gel cover that you would normally use on an exercise bike seat. What if your hands get fatigued with all that typing and you just want to rest your hands for a few minutes before you start typing again? Two words, Massage bar. The state of the art massage bar is one of the most selling features of this bike. Placed directly in front of the desk surface these hand-rests/massage-rollers provide the appropriate position for your forearms and promise a comfortable experience while typing. Now let’s talk about the main highlight feature of the bike, the desk surface. A 16” x 19” non-slip surface right in front of the massage rollers. 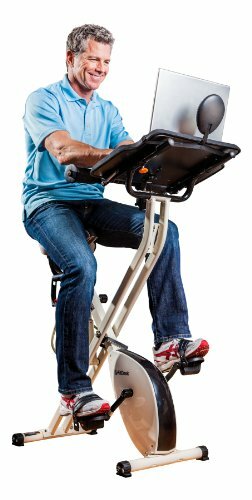 It claims to fit any size of laptop so you won’t have any adjustment issues while working and exercising. Beneath the desk surface is an easy access drawer which can be used to store different accessories such as your earphones, samrtphone, tablet, pens and papers. On the top of the desk surface is a console which provides information on how many calories you have burned, how many miles have you travelled, and the time of your workout. The key feature of the console is that when the user stops pedaling the timer goes into pause setting and starts from there when the user starts pedaling again. The console retains all workout data so you can look at it later and review your progress. This feature will prove to be very convenient if you’re using a work-out plan. The console meter is large enough to read while seating back on the seat and you don’t have to lean forward to get the readings. The bike powers two-way drive which lets you pedal both in backward and forward directions. The high velocity flywheel ensures a high grade riding experience as if you’re riding a professional exercise bike. The pedals come equipped with safety straps which though are not adjustable but are of adequate size to prevent your feet from slipping during work-out. A bike with such light weight and compact design must raise questions about sturdiness and stability. Also the fact that this is an entry-level exercise bike causes suspicion regarding the durability of the bike. But unlike most entry bikes FitDesk 2.0 does not have a plastic gearbox and aluminum frame; instead it comes with a stainless steel frame. The gearbox uses aluminum and steel to ensure reliable operation. It gives you the freedom of getting a hectic work-out without the fear of falling off of the bike or turbulence and unwanted shaking of the bike due to intense pedaling. The recommended height is from 4’10” to 6’5” and the maximum recommended weight by the manufacturer is around 250lbs. The bike comes half assembled. The instructions manual is quite basic and easy to follow. You will have to do quite little to put the machine together in working condition. Depending on your skill with the tools it will take you from 30 to 45 minutes to assemble the machine. FitDesk comes with a 30 days return warranty if you don’t like the product. Moreover FitDesk gives you one year warranty on frame and parts. Though light-weight, the bike is very durable. Console is placed at the back of the desk so if the laptop is open you won’t be able to see the console. No place for mouse as the desk surface is non-slip and mouse doesn’t work on that. Not suitable for professional work-outs. The FitDesk FDX 2.0 Desk Exercise Bike is appropriate to help you to have a vigorous exercise while working or playing games in the meantime. 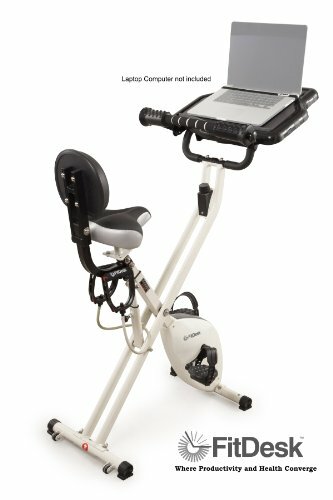 Though it is not a professional level exercise bike but if used correctly this bike can help you lose weight and get in shape. There are a lot of satisfied customers. In our opinion this innovative bike is a great buy if you are just looking to burn some calories while having the freedom to work and play at the same time. Want to lose weight while also attending to important work? Look no further than the FitDesk 2.0. making that possible for you and your workout needs.